The victories set up a very compelling Super Bowl matchup that in many ways will be painted as young (Rams quarterback Jared Goff and Coach Sean McVay) versus old (Brady and Belichick). But there are also many similarities between the two teams, and while some reasons for their success are obvious – Brady and Belichick are all-time greats, while McVay is considered perhaps the brightest young mind in the game – others are a little more hidden. As the NFL’s other 30 teams make their offseason changes, they would be wise to learn from these lessons from the Super Bowl participants. Los Angeles rebuilt its line with the additions last offseason of left tackle Andrew Whitworth and center John Sullivan – the two positions that most GMs around the league will tell you are the most important on any line. O-line coach Aaron Kromer is a valuable asset, as he picked up on how the Dallas Cowboys were tipping off their stunts and blitzes by the way they lined up before the snap in last week’s divisional-round matchup. Still, the Rams and Patriots (in addition to the Saints and Chiefs) deserve credit for embracing the analytics movement and being aggressive in going for it on fourth down. The four teams were a combined 38 of 60 on fourth-down attempts, converting 63.3 percent – well above the league average of 55.7 percent. The Rams essentially iced their win over Dallas in the divisional round with McVay’s decision to go for it on fourth and goal. 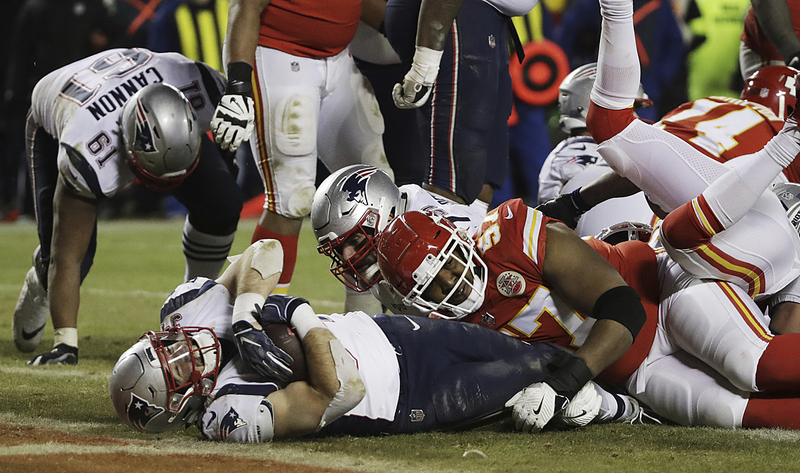 The Chiefs did make a critical fourth-and-1 stop of New England in Sunday’s game, but generally speaking, fortune has favored the teams willing to go for it on fourth down this season. For L.A., the running game – usually led by Todd Gurley, who was limited in Sunday’s win – is also a huge factor in setting up the play-action pass, including through the use of jet sweeps and other motion that McVay has become known for as a playcaller. The Patriots also ask a lot of their running backs in the passing game, with McDaniels finding creative ways to get them the ball out of the backfield.